The bailout, Northern Ireland, the Queen’s visit, the Republic’s role in the world, and golf were among the topics discussed by president Barack Obama and Taoiseach Enda Kenny at Farmleigh house this morning. Watch out! 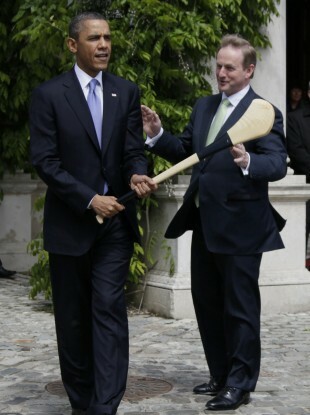 Obama is presented with a hurley by Kenny after their bilateral meeting today. US PRESIDENT BARACK Obama and Taoiseach Enda Kenny have held bilateral talks in Dublin this afternoon after which they spent a few minutes briefing the media. Kenny said that the discussions involved a range of issues including the ways in which Ireland is dealing with the banks, unemployment, the budget deficit, and the conditions of the EU/IMF bailout. The Taoiseach expressed appreciation for the general support of America in dealing with these issues. The situation in Northern Ireland was also discussed including the election of a new assembly as well as the historic visit of Queen Elizabeth last week. Kenny said that there would be no change on the policy of Shannon and the continued use of it by US forces on their way to the Middle East. Matters of immigration were also discussed following a recent speech by Obama. He said he wanted to “continue the bonds of trade and commerce” and said the US was “rooting for Ireland’s success” and would do everything it could to help Ireland on the path to recovery. Obama expressed extraordinary appreciation to Ireland for its international work and said that Ireland “punches above its weight” when it comes to its efforts abroad from peace keeping to the avocation of human rights. It speaks to possibilities of peace and people in long standing struggles being able to re imagine their relationships. To see Her Majesty the Queen of England come here and to see the mutual warmth and feeling that took place as a consequence of that visit and to know that the former Taoiseach FitzGerald was able to witness the Queen coming here…that sends a signal around the world. He quoted former US politician Bobby Kennedy in saying it sent “a ripple of hope” that he hoped would manifest itself in a range of ways around the world. In closing, Kenny said that a collection of Hawaiian children’s stories by Padraic Colum had been given to the Obama’s as gifts for their children Malia and Sasha. If you need someone to do some good writing – you hire an Irishman. The president also received a hurley from Kenny, waving it purposefully outside Farmleigh house as he departed and joking that he might use it on congress in the US. The presidential party then departed, bound for Obama’s ancestral home of Moneygall. Email “Kenny tells Obama: Bring your golf clubs next time ”. Feedback on “Kenny tells Obama: Bring your golf clubs next time ”.